Here, we review the role of pituitary adenylate cyclase-activating peptide-38 (PACAP38) in migraine and cluster headache (CH). Mounting evidence implicates signaling molecule PACAP38 in the pathophysiology of migraine. Human provocation studies show PACAP38 induces migraine attacks in migraine patients without aura and marked and sustained dilation of extracerebral arteries. Cluster headache is characterized by severe, unilateral headache attacks of orbital, supraorbital or temporal pain lasting 15–180 min accompanied by ipsilateral lacrimation, rhinorrhea and other cranial autonomic manifestations. 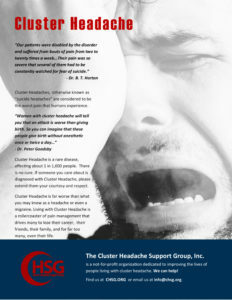 Cluster headache attacks need fast-acting abortive agents because the pain peaks very quickly; sumatriptan injection is the gold standard acute treatment. A great deal of studies suggests that cluster headache (CH) patients are usually comorbid to anxiety-mood spectrum disorders and psychopathological symptoms; however, the personality profiles reported in the literature strictly depend on type of assessment used. Psychiatric comorbidities have been extensively studied in migraine and they are recognized to represent a major risk factor associated with poorer outcome, playing a role in the headache chronification process at once as cause and consequence of it. By contrast the incidence and role of psychopathological aspects in CH is still not clarified, insufficiently explored as the striking severity of such a physical pain apparently leaves no room to psychological explanations. The aim of this study was to explore the possible role of tryptamine in the pathogenesis of chronic cluster headache along with that of adrenaline and noradrenaline (α-agonists) together with arginine metabolism in the origin of cluster bouts.